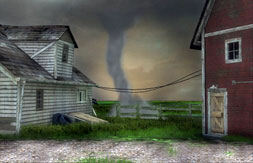 Trail of the Twister is the 22nd Nancy Drew adventure game in Her Interactive’s prolific series. In this most current outing, Nancy is deposited as an undercover member of an Oklahoma storm research team whose equipment is being sabotaged. A $100 million prize grant is at stake, so Nancy must pull out all the stops to discover just exactly what is going on at the farm research base. Along the way we meet Scott Varnell and the members of his research team, Debbie, Frosty and Chase. They each have their own set of motives and suspicions, but meanwhile there’s a twister approaching. The storm must take precedence, and there’s work to be done. Well, box my ears and call me Frederick, but it appears that they clean forgot to include a proper plot with this here game. There’s a storm research team, and there’s an as yet unknown somebody who may or may not be sabotaging their equipment. A prize grant is at stake. Nancy has to get to the bottom of it. The problem with this is -- and I do consider it to be a problem -- there is such a minuscule amount of dialogue which actually pertinently relates to the story that it might as well not exist at all. So instead, Nancy is presented with a list of chores as long as your arm, and the random puzzling and grunt work ensues. As thin storylines go, this is an extra-thin-crust pizza with a barely-there cheese topping. The puzzles had just jolly well better make up for it. And yes, they do, for the most part -- more of which later. The voice acting in any Nancy Drew game is invariably of excellent quality, and Trail of the Twister is no exception. I particularly appreciated Pa, the owner of the general store, who carries a genuine sad poignancy alongside his friendly outgoing demeanour. The first person point and click interface, graphics quality and music are all comfortably comparative with the other games in the series, no shake-ups or surprises on that front. There are relatively few locations to visit: the farm itself and its surrounding grounds; Pa’s store; the various static viewpoints accessible by vehicle, and that’s pretty much it. That’s a plus in as much as the player is not wandering around from one location to the next, wondering what on earth they should be doing or how they should be doing it. Trail of the Twister is a compact and well laid out adventure. So here we are with our puzzles ‘n’ chores; time to dissect and make some sense of ‘em. There are some enjoyable conundrums in Trail of the Twister; I will not say otherwise. An excellent variety of logic problems, spatial puzzles, gadget repair, photographic assignments and storm chart interpretation. Some of the puzzles will require thoughtful contemplation, but they are never so obtuse that one might visualise a cloud-bubbly “?? ?” over one’s head. Gameplay is fairly nonlinear, so if one puzzle is confounding you, take a break and move on to another for a while. One recurring mini-game involving mice did become repetitive and an eventual grinding chore. OK, so the farm has a mouse infestation: get over it already, and give poor Nancy a break. The gal has more important things to do. Such as driving her car/truck/cloud-mobile (delete as applicable) out on the open road, for instance. Her Interactive are becoming increasingly and worryingly overfond of giving Nancy vehicles to wreck -- er, drive. Those of you who have played Secret of the Old Clock and/or Ransom of the Seven Ships will have fond memories. The thing is, the vehicles in Trail of the Twister are extremely uncooperative. If I drove anything like this in real life then they would have locked me up and thrown away the key years ago. I’m lethal, baby. Grass verges, T-junctions, gargantuan trucks; I eat ‘em all for breakfast. There are no sliders, sound puzzles or mazes. There are the ubiquitous and humorous Game Over screens, but you know with Nancy Drew that you always have a Second Chance, so fear not. Trail of the Twister installed without any problems and played flawlessly throughout. In conclusion, this would be an ideal game for anyone not overly concerned with storyline but with a yen for some thoughtful puzzling and good-humoured fun.